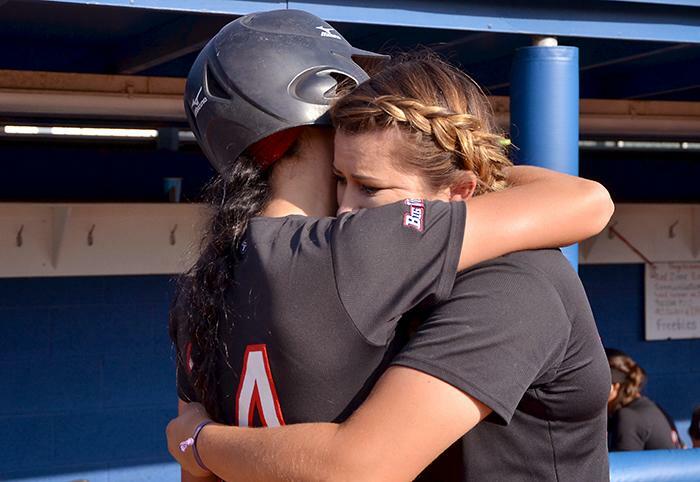 After seven close innings, the Matadors’ season came to an end, as CSUN lost 5-4 to the San Diego State Aztecs their second game of the NCAA Tournament. In the first inning, CSUN sophomore outfielder Taylor Glover hit a leadoff single on an error by the SDSU left fielder that dropped her fly ball. Three batters later, Glover stole third on a pass ball from SDSU pitcher Erica Romero. After scoring first it seemed the Matadors would remain with the upper hand. An RBI in the top of the third gave CSUN another run, but the bottom of the third was all about the Aztecs. An error in and home run in the third inning gave SDSU four runs, putting them ahead by two. In the top of the fourth, sophomore outfielder Carissa Sherman executed a suicide squeeze and scored senior outfielder Kaitlin Toerner from third, bringing the Aztec lead to one. The Matadors were then able to load the bases, but could not bring any more runs across the plate. With two down and nobody on in the top of the fifth, pinch hitter freshman catcher Cortney Horne hit a home run over the left field fence tying the game at four. SDSU had bases loaded no outs in the sixth, the Matador defense held tight and only allowed one run to score. However, that run would prove to be the winning run. Freshman infielder Savannah Horvath started the seventh inning for the Matadors with a strikeout, followed by a base hit from Hooper. Junior utility player Ariana Wassamer came up next, hitting against the fence. SDSU’s center fielder jumped and barely made the catch to get the second out of the final inning. Junior infielder Maylynn Mitchell came up next and got hit by a pitch to put runners on first and second with two down. Horne stepped up to the plate, only to strike out on a 3-2 count ending the game and season for the Matadors.